From September 19 to 26 I was on a cruise sponsored by the National Trust for Historic Preservation to the Greek Islands--entitled "Island Life in Ancient Greece. I also joined the three-day post-cruise tour -- visiting sites in the Peleponnese peninsula south of Athens. 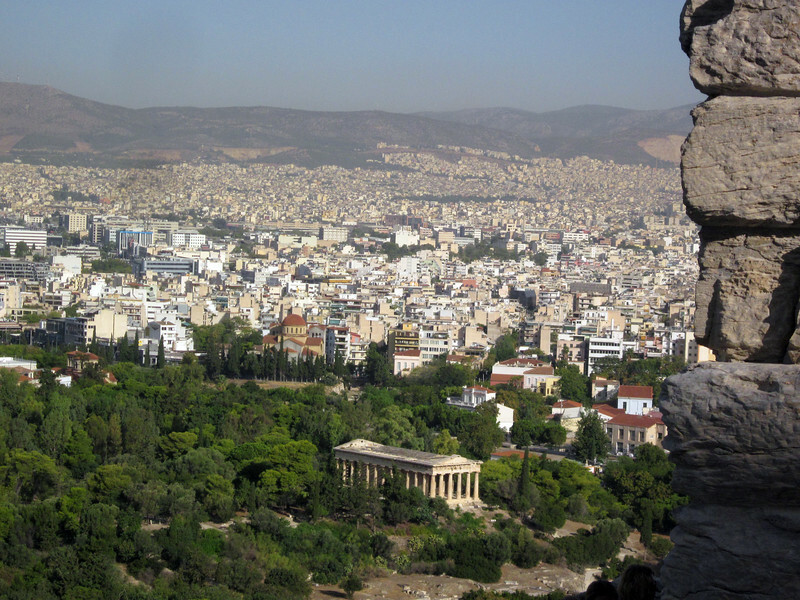 I arrived in Athens late the 18th and the 19th morning before joining my tour I visited the famed Acropolis--Aκροπολη. Our cruise, aboard the French ship "Le Lyrial", stopped at a different place each day, first Volos and Meteora on the Greek mainland -- then to the islands--Delos and Mykonos, Patmos, Rhodes, Crete, and Santorini. Climbing higher up the hill--view inland commands most of city of Athens.